Private Baths. "Oh Ma, there's somebody looking." A young woman and her mother are in a private bathroom. The young woman is standing naked, holding her dress in front of her, and looking at a hole in the window-blind behind which the shadow of a man in a top-hat can be seen peeping. Her agitated mother is in the bath-tub, about to pull a rope. On the floor is a crinoline petticoat, a red corset, and a pair of boots. 1 of 30 comic visiting cards, some hand-coloured. 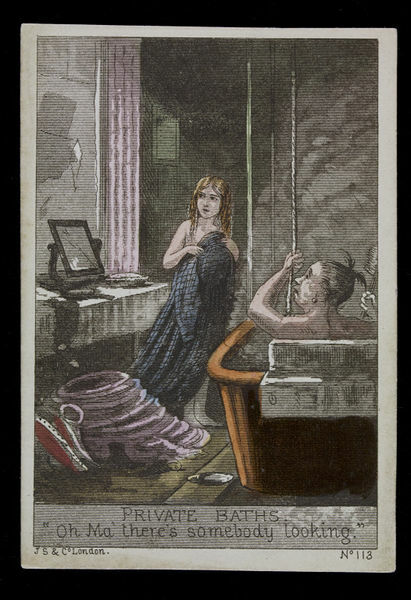 One of 30 satirical cards parodying carte-de-visites and calling-cards. Published by J. Simmons & Sons, 1860s.